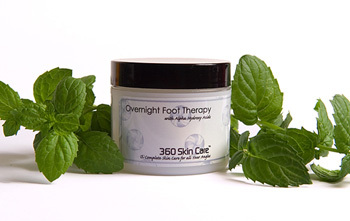 Prepare yourself for soft summer feet with 360 Skin Care’s Overnight Foot Therapy. We have created our treatment with a distinct combination of Olive Oil, Avocado Oil, raw Honey and Vegetable Glycerin. Our foot therapy will fill in the cracks in your feet to moisturize and soften overnight while Alpha Hydroxy Acids buff away dead skin. Peppermint Oil gently penetrates the top layer of the skin with Tea Tree Oil, to provide antiseptic properties. Your feet will be smooth and sleek and ready for your favorite pair of sandals. Kit includes 1 pair of spa socks & 2oz jar. Refill jar does not include spa socks.